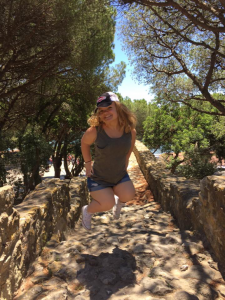 On one adventure to Europe, Taylor and her family backpacked all around Italy and Spain. Taylor recalled the modifications that they had to make to Olivia’s backpack so that she could independently carry it herself. 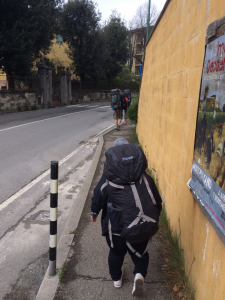 They modified her backpack by shortening the straps and limiting the weight to a maximum of a 50 lb. This brought a challenge in itself; even though Olivia needed a smaller backpack to be independent, she still had the same amount of supplies to carry. As soon as they landed, they realized the amount of walking they were going to have in the days to come. Taylor explained that Olivia has always been vocal when it comes to a challenge that may be uncomfortable in regards to her ability. However, she maneuvered the massive granite steps made for average-height limbs and climbed castles as the handrails met the side of her head. Olivia has a driven attitude and likes to be independent when it comes to everyday tasks. When Taylor began asking Olivia about traveling and what she found to be a struggle, Taylor explained that Olivia pivoted the conversation more towards what she was able to do by modifying her thought process, For example; light switches, sink faucets and toilet heights seemed to be double what they are in the states. Olivia said; “Climbing on counters has always been an interesting adventure in public places, I typically like to try and figure out how to do it by myself before I ask for help.” When Taylor was asking what hotels and public activity venues could do to make the environment more accessible she mentioned the lack of ramps and space in the small hotel elevator lifts. Olivia said she hopes to see progress when it comes to accessible features in hotels around the world as exposure to disability rights continue to increase. 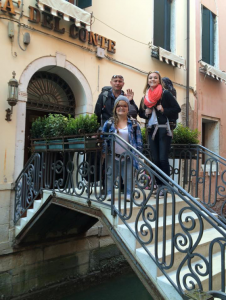 Olivia and family in Venice, Italy.